By the way, I've been working on some new originals and I'll be posting them this weekend on Etsy. Take a peek and take your pick! "Las 2 Fridas" 8x10 collage on wooden canvas. "The musician". 6x12 on wooden canvas. 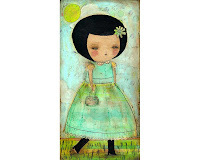 "Like a walk in the park" 6x12 on wooden canvas. 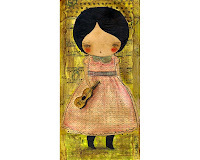 "Music girl 1" 4x4 on deep gallery wrap canvas. 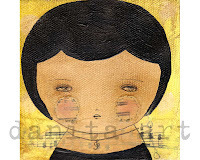 "Music girl 3" 4x4 on deep gallery wrap canvas. "Music girl 2" 4x4 on deep gallery wrap canvas. Boy you have been busy even during all this festivity. 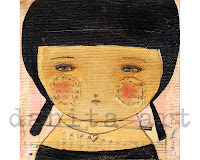 You know my paint brushes have started to collect cobwebs:( I like the music girl series! The paintings are all so lovely! Son una preciosidad,vamos como todas las que haces.Que pases un buen día. Feliz cumple! (tarde) espero que la pases re lindo en tu fiesta. I love these pieces that are translucent and the background shows through then Frida's little ghosty day of the dead friend You are just tooo talented!! i just love your music girls, lovely as always!!! 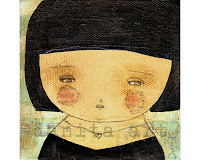 I love your Frida creations, they are soo cute and special!! 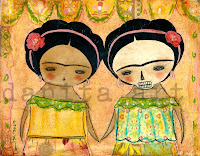 I love your Fridas...lovely work!! !